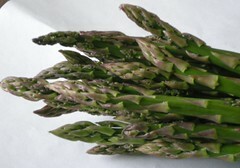 I might even go red wine territory if you broiled or grilled the asparagus and got a bit of a char on it. I’m thinking Chilean Carmenere. Thanks for adding them. Keep on adding. I love your blog. I love the widgets! They are addictive. Thanks for the kudos!